The days are starting to get longer and the temperatures are starting to rise. It’s also the time of the year that we start to wind down the use of our fireplaces and wood burning appliances due to the warmer temperatures. Many shut them down and don’t think about them till the chill hits the air again in the fall. Why wait till the fall when the mad rush starts and you’re put on a waiting list for weeks or months? This is the perfect time of the year to have your fireplace and wood stove or insert cleaned and inspected! Yearly cleaning prevents build-up of soot and dangerous creosote which can cause chimney fires. The yearly cleaning can also catch and fix problems before they become more serious and more costly to fix. Other issues such as cracked chimney crowns or corroded chase caps can be identified. 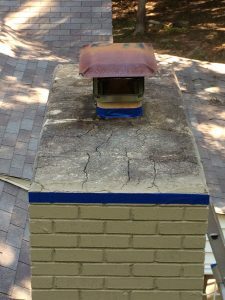 A cracked or worn chimney crown will allow water to penetrate from the top, and water always flows to the lowest point. Over time this will deteriorate the mortar and bricks leading to expensive repairs. Older chase caps on prefabricated chimneys can rust to the point where perforations occur allowing water to drip down on top of the fireplace. Again, over time this will lead to damage and mostly like to the replacement of the entire unit. 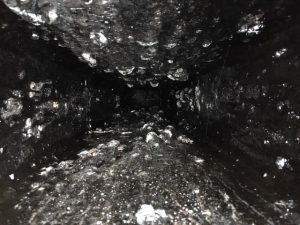 The above pictures are examples of a chimney that was not maintained and resulted in significant creosote build-up. The other is of a cracked and worn chimney crown. Since spring house cleaning will be around the corner why not include and schedule a chimney cleaning and inspection? You will thank yourself later this fall when that first chill hits. You will be able to start your fire with confidence that you’re ready to burn for the season!